Brands should be doing everything they can to infuse as many sensory triggers as possible into their advertising, according to syneasthesia research by Marianna Bolognesi and Francesca Strik Lievers. We’re so bombarded with commercial messages every day that creating an ad that actually sticks in the mind is an increasingly difficult task. Research shows that one way to make advertised products more memorable is to engage consumers’ feelings and emotions by stimulating multiple senses at once. And advertisers are now more consciously using this approach in what you’d typically think of as a visual-only medium: print images. Marketing has undergone what researchers have called a multisensory revolution. Browsing the shops around Christmas time, for instance, is typically a multisensory experience, and that’s no accident. Shops combine ambient Christmas music and Christmas-related scents to influence consumers’ behaviour and increase sales. Video advertisements also resort to the multisensory strategy. McDonald’s ads, for example, display the famous red and yellow logo that triggers a representation of the brand stored in our mind through the sense of sight, together with a now well-known tune that triggers a representation of the brand stored in our mind through the sense of hearing. The brand is encoded in our memory by means of both visual and audio elements. This establishes immediate and subconscious associations between the different sensory stimuli – the images and sounds – and the advertised product. Multisensory marketing has also made its way into print advertising. To convey a multisensory message within a medium that is chiefly experienced by sight, advertisers use language and images to evoke the other senses. Evoking individual senses in print is relatively straightforward, using words like ‘smell’, ‘hear’, or ‘yellow’, and images of objects that we strongly associate with specific senses, such as a bottle of perfume (smell), or a bar of chocolate (taste). But words and images can also evoke multiple senses within the same ad, and in the most creative ways. The chief method for making multisensory print ads is employing linguistic synaesthesia. Not to be confused with the neuropsychological condition synaesthesia, this is a type of metaphor created by combining linguistic expressions that refer to different senses. For example, ‘sweet melody’ (taste and hearing) and ‘soft voice’ (touch and hearing). Print ads often display synaesthetic slogans. For example, the Hogwine food company advertises its potato chips with the slogan “Like sweet banjo music to your tongue”. The chips’ taste is associated with music, which is in turn described as “sweet”, an adjective that primarily relates to taste. Our recent research shows how synaesthetic associations can also be created by the image only, in what researchers call visual metaphors. For instance, Popclik advertises its headphones by showing them on a comic-like black and white background. 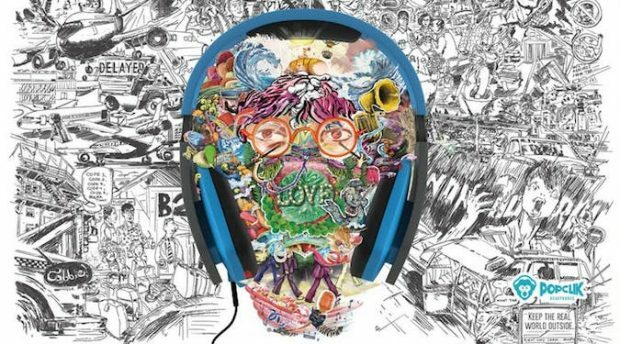 Here, only the drawings within the space defined by the headphones are illustrated in colour. The positive feelings that we tend to associate with colourfulness (as opposed to black and white) are arguably used to convey a positive judgement about the quality of sound that the advertised headphones reproduce. In other words, this advertisement is an example of a visual synaesthesia by which sound is described in terms of colour. Not only do we have purely linguistic and purely visual synaesthesia: language and images can also interact. The image above advertises Toblerone through the image of a triangle, a musical instrument that recalls the characteristic shape of the chocolate bar. Music is also mentioned in the slogan “Music to your mouth”, where it is explicitly connected to the taste of the advertised product. In other ads, the image seems to visually ‘translate’ synaesthetic combinations that are commonly used in language. For instance, a lemon-flavoured soft drink has been advertised by the image of a lemon wearing a spiked mask. This combines with the slogan “L&P sour lemon. Sharp as. Bit different aye”. Together they provide a visual realisation of the conventional and commonly used linguistic synaesthesia ‘sharp taste’, with the lemon representing the taste and the spikes on the mask the sharpness (touch). Visual communication is extremely powerful. As these ads show, it allows us to evoke multiple sensory domains and establish creative associations between them by effectively combining words and images. What’s not yet clear is whether these synaesthetic print advertisements have the same effects on sales and brand memorability as the complex experiences used in multisensory experiences. If so, learning how advertisers use these techniques to brand new products can help us to become more aware of our behaviour as consumers.